Eric on this week's concerts and Reed on the two-party debate that has only one, pro-war side. Marcus Roberts brought an impressive array of musicians with him to the Appel Room last weekend for a show he called Piano Masters of Melody. The PMMs in question were Jelly Roll Morton, Thelonious Monk, Horace Silver, and Chick Corea. The band, The Modern Jazz Generation, featured Rodney Jordan, bass; Jason Marsalis, drums; Alphonso Horne and Tim Blackmon, trumpets; Ron Westray, trombone; Corey Wilcox, trombone and tuba; Ricardo Pascale, saxophone; Tissa Khosla, baritone and tenor saxophones; Stephen Riley, tenor saxophone; and Joe Goldberg, clarinet. The set itself was made up of just-beneath-the-radar compositions by the featured PMMs, with newly commissioned arrangements by members of the TMJG, though Marcus did a stunning “Round Midnight” solo on piano. Overall the presentation, while sharp and tight, was rather formal—which strikes me as a reflection of Roberts himself. It was lovely as always to be in The Appel (formerly Allen) Room, but I thought it could have swung a bit harder. That was not the case with the wonderful set I caught at Dizzy’s Club the next night with Jimmy Heath, Albert “Tootie” Heath, David Wong, and Jeb Patton playing timeless riffs as if they had been invented on the spot just for the fun of it. Close your eyes and you think time had stopped. Jimmy carries jazz history on his shoulders with remarkable agility for a guy born in 1926 and who made his career playing with Dizzy, Parker, Miles, Chet Baker, Art Pepper, Gil Evans and, well, one could go on. While his younger brother “Tootie”—born in 1935—played with Coltrane, Wes Montgomery, Art Farmer, Sonny Rollins, Nina Simone—you get the point. It was simultaneously a celebration of longevity, the power of musical creativity to keep one looking, sounding, and I’m guessing, feeling young, and joyous music. One thing, though. People need to know that if you’re going to go to Dizzy’s, you have to shut up let people listen, even if you yourself, lady in the red dress, are too stupid to appreciate it yourself. Here is the upcoming schedule for Jazz at Lincoln Center. Before going to Dizzy’s, I spent a thrilling 5.5 hours at the 52nd New York Film Festival with a brand-new print of Sergio Leone’s masterpiece, Once Upon a Time in America, not only restored to original edition—not the bowdlerized version released in the United States—but with an additional twenty minutes of found footage. What an incredible film this was: a Jewish Godfather, only more violent (and to be fair, filled with a few more clichés), but just as ambitious and in many respects just as beautiful. The cast includes Robert De Niro, James Woods and Treat Williams—who were all there to help introduce the new Williams print, and Elizabeth McGovern, my distinguished former student Jennifer Connelly (who was 13 at the time), Joe Pesci, Danny Aiello, Burt Young, Tuesday Weld, and who knows who else. A terrific Ennio Morricone score adds to its haunting quality. This version is about to be released on Blu-ray but what a thrill to see it on that big beautiful screen. Here and here are the Times’s write-up of the highlights of the festival. So far I have only been able to see two or three films in the press screenings, and I hope to have more to say next week. In any case, here is the schedule, if you’re in town. Finally, my friends at the Library of America have released a The Civil War Told by Those Who Lived It in a four-volume boxed set edited by Aaron Sheehan-Dean, Brooks D. Simpson, & Stephen W. Sears. The collection is a tribute to the question asked by Edmund Wilson in Patriotic Gore: “Has there ever been another historical crisis of the magnitude of 1861–65 in which so many people were so articulate?” The set has been available before but not boxed and so fancily presented with four pull-out posters featuring full-color maps by expert Civil War cartographer Earl McElfresh. There is a central conceit to how the establishment press covers policy debates in this country. In essence, it’s a broad skepticism that there is really that much to debate in the first place. The roots of this incuriosity can be traced back to the mechanisms of mainstream journalism itself. Rather than shoulder the burden of exploring important issues head on, our media elite has decided it much prefers to come at things obliquely, using the political parties as proxies to set the boundaries of discourse. This strategy has come at a dear cost to our democracy, though. While relying upon partisans to frame every debate has allowed the press to maintain a pose of balance and neutrality, it has also trained the press to look only at the politics of every fight at the expense of the policies and principles behind it. Is it any wonder, then, that a jaded, cynical press corps now suffers from an acute case of “both sides do it” syndrome? That it routinely misinforms the public by misinterpreting the motives of various political actors and conflating their policy goals? That, in reaction to a falsely equivalent outrage at partisan acrimony, it consistently advocates for its own agenda, one marked by chimerical “grand bargains” and unrealistic compromises? The upshot of all this is a Beltway media elite that sees political parties mostly as fungible items and consistently seeks to narrow the spectrum of debate between them as often as it can. As a result, the press often lends its imprimatur to certain (often conservative) policy solutions deemed “serious” within DC conventional wisdom—as in, “everyone knows” we have to cut Social Security and Medicare to deal with the federal debt. Yet, as frequently as this groupthink occurs on the domestic policy front, it really can’t compare to the single-mindedness of the elite media’s views on US foreign policy. As Leslie Gelb, the Pulitzer Prize-winning journalist and chairman emeritus of the Council on Foreign Relations, explained earlier this year, there really is only one answer to every foreign policy crisis here in the US. As someone who also supported the Iraq War in its early stages, Gelb readily acknowledged an ugly truth about our discourse: the only way to maintain credibility in foreign policy and media circles is to advocate using military force (5:40 mark in this video). If you don’t, your viewpoint simply gets disappeared from the debate. “People dismiss you. You don’t get asked to testify on the Hill. You don’t get asked on most television shows,” he notes. In short, Gelb confirms what we’ve already known for years—our media establishment’s default position on foreign policy is pro-war. If you have any doubts about this, one need only look at our current news landscape, where heated coverage about the “imminent” terror threats from groups like ISIS and Khorasan lead the TV news broadcasts and run above the fold nearly every day. All too often, pundits from both the left and right have marched in lockstep with the war drums, all the while ignoring sober rebuttals and disregarding troubling omens about what might lay ahead. Consequently, much of our “debate” over bombing ISIS and arming the so-called moderate rebels in Syria has bordered on the absurd. “Who are the troops who are going to be there to guarantee stability, order and some sense of justice in the areas? "You can't do that with airstrikes. I mean, airstrikes are wonderful." Shields’ comments, which it’s worth noting didn’t merit even a raised eyebrow from Brooks or the NewsHour host, exemplifies how the debate over our latest war is being conducted entirely on pro-war territory. It serves as a reminder of the folly of expecting a legitimately robust war debate to occur within a narrow band of establishment thinking. Indeed, it’s not an understatement to say that our media has failed our democracy over the past few weeks, routinely skipping right past the first-order discussion of if we should go to war or not, to instead obsess over when and for how long. Now, it’s true that a large majority of Americans currently support the president’s ongoing US airstrikes on ISIS targets. (After all anxiety-inducing coverage of late, this trend is hardly surprising.) Nevertheless, the public remains highly dubious of this war. The same CNN poll this past week also found a solid majority of the public still oppose sending in US combat troops on the ground. But even more telling, nearly two-thirds of the public lack confidence that the US can achieve its goals in the fight against the terrorist group. Moreover, there’s noticeable skepticism on Capitol Hill as well. The recent House vote to provide military materiel to Syrian rebels in the fight against ISIS did pass 273–156, but that means more than 36 percent opposed it. (Nearly 43 percent of the Democratic caucus voted “Nay.”) When the same measure came before the Senate, it passed with a larger majority, but still 22 Senators voted against it. And note these amendments were tucked into the larger, must-pass Continuing Resolution, which funds the government through the rest of the year. All told, that means one-third of the members in Congress balked at a key part of the President Obama’s ISIS war plan and roughly the same percentage of the public has registered their opposition to airstrikes. Don’t these constituencies deserve more than to have their views effectively shut out of the highest-profile news platform in the Beltway? “We're still bombing them. Does any sane person think that 13 years from now we're not going to still be bombing them? The ease with which Carville endorses endless war and consigns thousands of Middle Easterners to death is breath-taking and inexcusable. Sad to say, this is what normally passes for left-wing argument on Sunday mornings, thanks to the media’s penchant for inviting an almost endless parade of Democratic hawks on the air. And yet, as gruesome as his views are, Carville at least took it upon himself to call for Congress to hold a vote on going to war in Syria, which is more than most guests bothered to do. Retroactive and accommodating aren’t exactly the kind of terms one would hope a full-bore, substantive war debate from Congress would evoke. But on Sunday mornings, this kind of talk is considered eminently reasonable. In something of an ironic twist, the most skepticism of the war that you will find on Sunday mornings occurs on Fox News. On several occasions over the past month, Wallace has pointed out the public’s doubts about the war and questioned the efficacy of the administration’s strategy. Even George Will has mustered tepid resistance to parts of the Obama war strategy, as he did this past weekend on Fox News Sunday when he characterized intervening in the Syrian civil war as “a recipe for another protracted failure.” But of course these criticisms are all in service of Fox News’s larger twin goals of a) tearing down the president at every opportunity and b) rekindling the neoconservative fantasy of an even wider war—with ample US “boots on the ground”—in the Middle East. The gravitational pull of this last course of action is unmistakable at this point. In fact, a large majority of Americans now anticipate US combat troops will one day be deployed to fight ISIS directly. And, frankly, why wouldn’t they think this? Since even before the president committed to airstrikes, voices throughout the media elite were agitating for him to do more. And once loosed, the machinery of war is almost impossible to shut down, even after 13 years. Often, the only things that stand in its way are tough questions from the press and a public dissatisfied with the answers that they get in return. 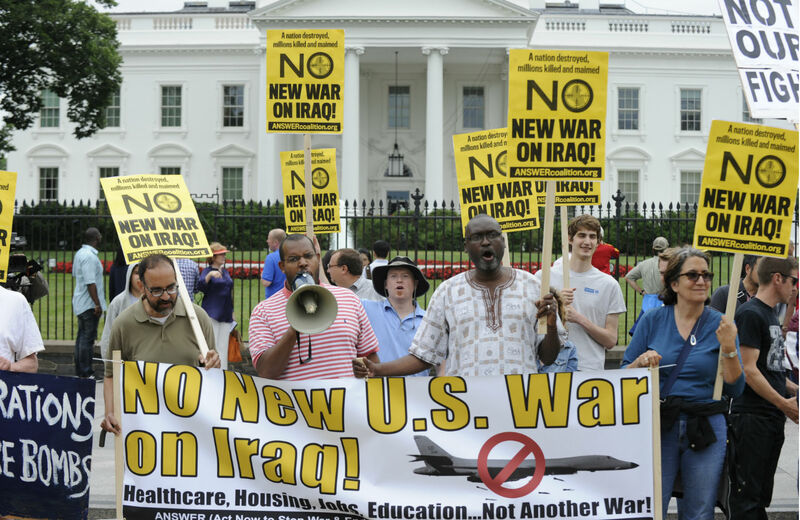 A two-party debate that only has one, pro-war side? Sounds like just the kind of news show for a Sunday morning. One thing I find very interesting is the "100% of GPD!" debt hysteria. Most of the people I know have mortgages that are 2-5 times what they make in a year. No one freaks out about that! And this is despite the fact that none of my friends control their own currency. And note: the federal debt was higher after WWII and it is far higher in Japan and has been without any kind of a debt "crisis." There is no pleasing these people. And that is because they lie about what they are trying to do.